Anybody knows if ‘i’ get transcript of this talk…? Thank you so much Lorenzo! This talk was great, I haven’t heard it and I’m going to listen to it a bunch of times. I’m finally tackling the Illuminatus! Trilogy, its fantastic. My first read of Pope Bob was Cosmic Trigger Vol. 1. Mind-blowing. 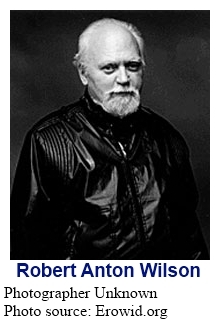 And the synchronicities that have happened around my interest in his work are uncanny, such as three different people in the same bookstore that never has Robert Anton Wilson in stock, all finding seperate copies of the Illuminatus! Trilogy at the same time. And a story about Tim Leary contacting him from the dead which I listened to earlier this day I was contacted by a loved one who had passed away, which also coincided/synchronicitized with the culmination of Cosmic Trigger. I literally burst out in tears because of how in my face these synchronicities came together. I hope you have some more Pope Bob up your sleeve for us! I’ve learned so much from listening to and reading Terence and Bob. They are my favorite philosophers, definitely most influential and I haven’t thanked you enough for doing the Salon. It makes my day. Here’s another synchronicity, related to the Salon. The other day, I searched youtube for Robert Anton Wilson Boulder just to see if there were some Boulder talks I hadn’t heard. Came up with nothing new. The next day, I said to myself, “Let’s see what Lorenzo put out last.” Boom. Robert Anton Wilson in Boulder. The year I was born… hahahahaha!! I wish I could explain all the synchronicities in detail because they are so heavy and personal. I wasn’t truly a “believer” until these experiences. And I wouldn’t have been as tapped into all of the magic that I see now without the Psychedelic Salon, so much thanks again you really have been there for us all, we needed you. I’ve been listening for nine years. I haven’t donated money but once, but I have turned many people on to the Salon. When I tell certain people to check out the Salon, they come back to be saying they can’t believe that there were this many intelligent people in the Tribe! I really can’t thank you enough!! Last thing, Bob didn’t write the Principia Discordia. It was Kerry Thornley and Greg Hill. Bob and his co-author Robert Shea write about the Principia in the Illuminatus! Trilogy. But MAYBE Bob helped with some of the editions of the Principia. Maybe… 😉 Godblessit Lorenzo! Thank you again so much! Hail Eris! Thanks Lorenzo, this talks was absolutely phenomenal – what a way with words RAW had, eh? The “reality tunnels/reality labyrinth” was my favourite part hands down. The Illuminatus trilogy is one of my favourite book series ever, and there’s an audiobook/radio play version of it floating around on Youtube somewhere that I can’t recommend enough – it really brings it alive to hear it done by a bunch of eccentric actors. R.A.W. is amazing, and i’ve never heard this particular talk. Thanks Lorenzo. of the existential gloom. Thanks again and am eagerly looking forward to hearing contemporary psychonautical thinking. Eternal blessing. Thank you very much for that. appreciated.